Just noted that today marks Ada Lovelace birthday. She was an English mathematician and is considered one of the first programmers. She described an algorithm that Charles Babbage’s Analytic Engine could use to find Bernoulli numbers. The Engine was never constructed – not even until today! She died at the age of 36. 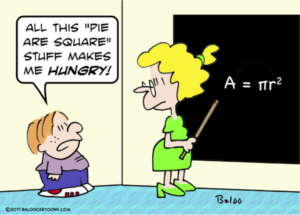 Today is the Pi day, March 14th, i.e. 3/14 in the American notation. As a Mathematician and Statistician, it is difficult for me not to marvel about the ways in which special numbers like \(\pi\) appear in many different, apparently unrelated places in Maths, Stats and real life. \(\pi\) is of course a ratio of a circle circumference and diameter. There is another, much more chaotic, side of \(\pi\) – the apparent unpredictability of its digits. \(\pi\) is supposedly a normal number in that if in its sequence of digits, all digits and all subsequences of digits are equally represented. Although it has not been proven that \(\pi\) is indeed normal, this property seems to be well supported. In other words, if I tell you that the fifth digit is 5, each of the 10 digits (0, 1, 2, …, 9) can come next and so I cannot really conclude that sixth digit is more likely to be 9 (3.14159…). I find it really amazing that there is so much to a humble number \(\)\pi\(\) and that it shows so much simplicity and at the same time so much complication, so much structure, and at the same time so much randomness and unpredictability. If you want to see more information on the randomness aspects of \(\)\pi\(\), please see the slides from my public lecture given at the University of Stirling in 2013. You can find it at SlideShare. Indeed, Laura Ingalls Wilder described in her book the famous 1880-1881 winter which is considered the most severe winter in the United States ever. 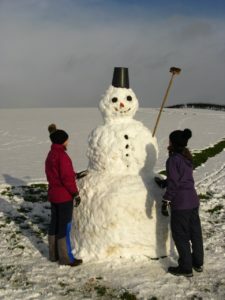 So, given that in recent years we in the UK had six years without much snow followed by a snowy and cold winter, is there any evidence for the seven years cycle? Note that 2017-18 winter is really not included, as the data include December 2017 but exclude January 2018. 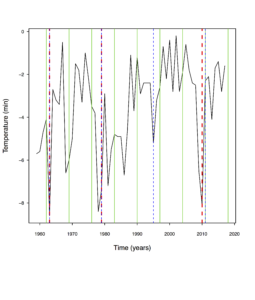 Green lines show the 7 years interval. In addition, the red lines show very snowy winters in the UK following the Snowfall catalogue by Bonacina and O’Hara. More about blue lines below. 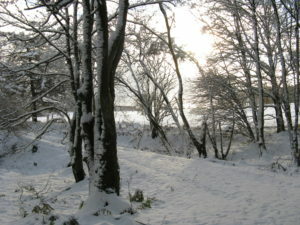 It is very clear that although 2010-11 winter had some snow and cold weather, it is 2009-10 winter that stands out. Moving back 7 years, 2002-03 and 2003-04 were quite mild and we need to go back to 1984-85, 1978-79 and 1962-63 to get similar temperature and frost records and snowfall. As shown by blue lines in the plots above, this might suggest a 16 years cycle. This cycle would include 2000-01 winter that was actually quite cold, although only with the average snowfall in the UK; it also points to 2010-11 rather than 2009-10 and predicts 2026-27 as the next ‘big snow’. A statistician would point to many problems with the above analysis, as it reflects our ability – and probably a need – to find patterns in random data. Instead, we should be looking for more scientific explanations. There are many hypotheses why 2009-10 was such a cold winter and whether this reflected any cycles. 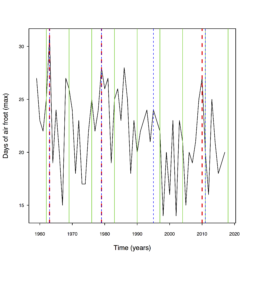 Solar activity (22 years), the North Atlantic Oscillations (no fixed pattern, but 12 years cycles suggested). 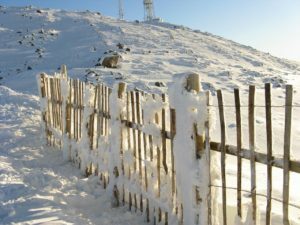 It is too early to say whether 2017-18 will also prove a really cold winter and why it has so far produced a lot of snowfall in the UK. Statistically (in)significant: New Year’s resolutions. It is one of my New Year’s resolutions to be more active in the internet domain, so here is a part of the package. 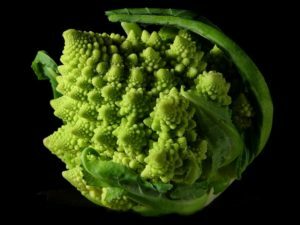 This blog will be about statistics, its use and abuse; about mathematics, particularly mathematical biology (which is what I mostly work on); and about life as related to mathematics and statistics. 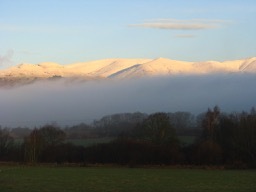 In the meantime, best wishes for the New Year 2018 – with a picture of Ochil Hills (Scotland)! Author adminPosted on December 30, 2017 December 30, 2017 Leave a comment on Statistically (in)significant: New Year’s resolutions.